We spent a lot of time taking care of our teeth because they are one of the most important factors of our facial beauty. Nobody wants to feel uncomfortable and unattractive when smiling, and that’s why we invest a lot of time and money in our teeth. However, sometimes even the money and effort we spend won’t lead to good results. There must have been some point in your life where you wondered why you even bother flossing and buying all those oral products, when you still don’t get even remotely close to the smile you want. Furthermore, most modern products contain various chemicals and substances that are not beneficial to your teeth, but quite the opposite – they cause tooth decay, irritations, and intense aches. But fortunately, there is always an alternative and the one we offer is cheaper, safer, and more effective. We are talking about making your own organic toothpaste and teeth whitener. Our recipe will convince you to stay away from most oral hygiene products for good. 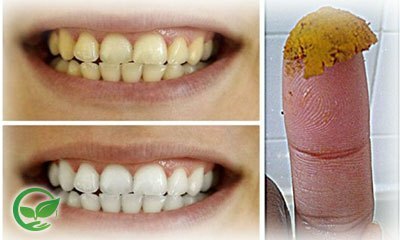 And the plus side is that you will never again have to fear that what you’re using for your teeth will eventually destroy them in the long run. The base for our recipe is the turmeric, a favorite spice to many, especially people coming from the India region. But turmeric is so much more than just a spice. It has been used for decades in alternative medicine because it was considered a very potent anti-inflammatory agent, and in more recent times it found its use in oral medicine as a very effective mouthwash, especially in gingivitis cases, as stated by the Indian Periodontology Society. Coconut oil (1 tablespoon of). Your turmeric toothpaste is very simple to make and use. All you need to do is to combine all of the ingredients together and stir until you end up with a thick paste. Use the paste as you would use your store-bought paste; however, let the paste work its wonders for 3-5 minutes before your rinse your mouth. You should notice results as early as a couple of days from your first use. Try it for yourself and see your smile change.